We’d love your help. Let us know what’s wrong with this preview of Sunset by Erin Hunter. Erin Hunter's #1 nationally bestselling Warriors series continues in Warriors: The New Prophecy--now featuring fierce new art. The sixth book in this second series, Warriors: The New Prophecy #6: Sunset, brings more adventure, intrigue, and thrilling battles to the epic world of the warrior Clans. As shadows of the past continue to plague the forest, Brambleclaw is haunted Erin Hunter's #1 nationally bestselling Warriors series continues in Warriors: The New Prophecy--now featuring fierce new art. The sixth book in this second series, Warriors: The New Prophecy #6: Sunset, brings more adventure, intrigue, and thrilling battles to the epic world of the warrior Clans. As shadows of the past continue to plague the forest, Brambleclaw is haunted by a dark figure on a dangerous quest for revenge, and must struggle to remain true to his Clan. A sinister path is unfolding and the time is coming for certain warriors to make the choices that will determine their destinies...and the destiny of all the Clans. To ask other readers questions about Sunset, please sign up. What kits do Bramleclaw and Squirrelflight have? This answer contains spoilers… (view spoiler)[ Through the third series, Power of Three, it is believed that Lionblaze, Jayfeather, and Hollyleaf are Squirrelflight and Brambleclaw's kits. However,…more Through the third series, Power of Three, it is believed that Lionblaze, Jayfeather, and Hollyleaf are Squirrelflight and Brambleclaw's kits. However, it turns out that they are actually the kits of Leafpool and Crowfeather, Crowfeather of which does not know that they are his children. Leafpool gives her kits to Squirrelflight to raise and keeps their true origins a secret from the Clan until Hollyleaf reveals the truth at a Gathering. Brambleclaw did not know about this. Fitting end to the second series. I like how things were wrapped up into a semi-neat bow with enough dangling threads to keep us wanting the third series. These books are addicting!! This review has been hidden because it contains spoilers. To view it, click here. This book is amazing. Every time I finish it, even if it's not for the first time, my heart beats as furiously, I am as sweaty and pale, and I feel as shocked as if I had been in the book and experienced the appalling turmoil that the main character had just been in. Every time I re-read it, it is as exciting and terrifying as if I had read it for the first time, and all the same things happen to me. It's the end that is the best part. It is everything that makes the best books so good. It is fu This book is amazing. Every time I finish it, even if it's not for the first time, my heart beats as furiously, I am as sweaty and pale, and I feel as shocked as if I had been in the book and experienced the appalling turmoil that the main character had just been in. Every time I re-read it, it is as exciting and terrifying as if I had read it for the first time, and all the same things happen to me. It's the end that is the best part. It is everything that makes the best books so good. It is full of cruel treachery and betrayal, heightening suspense, heart-stopping excitement, intriguing mystery, paling shock, and more the like. I think that if an author not as talented as Erin Hunter would have braved to write such an ending, it wouldn't have been as good. I think this is my favorite book in the whole warriors series. Even Erin Hunter would be hard-pushed to write a warriors book in a better way. The book's narration was shared again, by LeafPool, and she was also aware of BrambleClaw's dreams with TigerStar, and while she was often worried about this, she didnt let it could her judgment when StarClan gave her an omen that BrambleClaw was to be made clan deputy. A great installment in the 2nd Warriors series. I was never bored, the pacing was steady and interesting; although the ending had a very rushed feeling. Despite that, it much less predictable than many of the earlier books. The continueing drama of the intertwined lives of Tigerstar and Firestar and their families is really well-played in this book; and the glimpses of StarClan and the shadowy forest are especially intriguing and satisfying for those of us interested in the Warriors' world. Can' A great installment in the 2nd Warriors series. I was never bored, the pacing was steady and interesting; although the ending had a very rushed feeling. Despite that, it much less predictable than many of the earlier books. Leafpool is now mediciene cat of Thunderclan, while Squirrelflight falls in love with Brambleclaw and Brambleclaw figures out that power isn't always a great thing. Soon after the cats reached their new home by the lake, ThunderClan's medicine cat Leafpool received an ominous warning from StarClan: Before there is peace, blood will spill blood, and the lake will run red. As the Clan slowly recovers from a devastating badger attack, Leafpool can't help but wonder . . . do her prophetic dreams mean there are even worse dangers still in store for the warrior cats? At the same time, shadows of the past continue to haunt the forest as some old friends struggle to find their place, others appear to be lost forever, and an old enemy finds a new way to resurface in a quest for dark revenge. A sinister path is unfolding, and the time is coming for certain warriors to make the choices that will determine their destiny . . . and the destiny of all the Clans. I actually really loved the plot in this Warrior book. Of course, I always do. It was thrilling, and I read it in 1 day. In almost every Warrior book, there's a huge war, and I was glad to see a change for this one. There wasn't technically a war, but they was was major fights that were with few cats. Although, some plot twists were obvious, but yet again, Hunter leaves me off with a major cliffhanger and I MUST start the next book ASAP. Erin Hunter is my second favorite writer of all time. She/they are such amazing writers, and I LOVE their writing style. It's so easy to read, but it's beautifully complex at the same time. There was so much character development in this novel, it was unbelievable. Sometimes, you can't trust ANY cat, and you have to wait for the novel to reveal the traitor. One thing that bothered me, was Brambleclaw and Squirrelflight started picking up their "relationship" like nothing had EVER happened. That bothered me, and if you've read this book, you would know what I'm talking about. 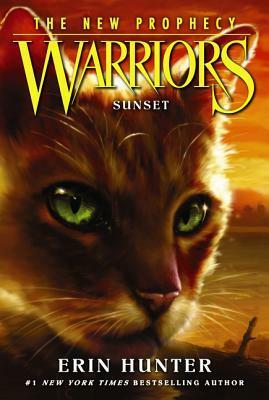 Sunset is probably one of the more intense warriors books, showing the aftermath of the badger attack and what happens to ThunderClan afterwards and which clashes with other clans happen. After the badgers are fought off by ThunderClan, Stormfur and Brook Where Small Fish Swim journey to ThunderClan and arrive immediately after the last badger has left. (Besides Midnight) Shocked at what has happened, they offer to help rebuild the camp and help to return ThunderClan to full strength. Graystripe has been gone for moons and even Firestar is giving up hope. ThunderClan needs a new deputy, whether Graystripe is alive or not. ¡Que manera de terminar la serie! Me ha tenido pegada al libro todo el tiempo, y si no hubieran decidido seguir las traducciones, ya me veía con los libros en inglés y buscando los nombres de los gatos para identificarlos. Me encantó. Me ha roto el corazón pensar que no volveré a ver a Látigo Gris, pero sabíamos que sucedería, el pobre lleva desaparecido toda la serie. Zarzoso me había estado dando mala espina desde sus reuniones con Estrella de Tigre, pero vaya, no me esperaba ese final en lo a ¡Que manera de terminar la serie! Me ha tenido pegada al libro todo el tiempo, y si no hubieran decidido seguir las traducciones, ya me veía con los libros en inglés y buscando los nombres de los gatos para identificarlos. Me encantó. Me ha roto el corazón pensar que no volveré a ver a Látigo Gris, pero sabíamos que sucedería, el pobre lleva desaparecido toda la serie. Zarzoso me había estado dando mala espina desde sus reuniones con Estrella de Tigre, pero vaya, no me esperaba ese final en lo absoluto. Alcotán me ha dado una enorme sorpresa con sus intenciones. Y creo que es la primera vez en todo lo que va de los libros que de verdad temí por la vida de Estrella de Fuego. Me estaba infartando. Wow, just wait until the prophesy is fulfilled. Before there is peace blood will spill blood and the lake will run red. Y llegamos al final de esta nueva saga. Los cuatro clanes ya están totalmente instalados en su nuevo hogar, pero siguen habiendo rencillas que los separan, aunque también elementos que los unen. El ansia de poder continúa presente en los hijos machos de Estrella de Tigre, Zarzoso y Alcotán. Aunque se nota que Alcotán piensa de forma mucho más parecida a su padre que nuestro querido Zarzoso. Ahora Hojarasca Acuática es la curandera oficial del Clan del Trueno, y el Clan Estelar le dio la responsabilidad de velar por Blimosa, la aprendiz de curandera de Ala de Mariposa, del Clan del Río, y enseñarle todo sobre el Clan Estelar por la inhabilidad de su mentora al respecto. Me gustó mucho el desenlace de esta saga. Los personajes quedaron bien definidos, las distintas relaciones desarrolladas y los clanes asentados en su nuevo hogar. Lograron superar los problemas que los aquejaban, y hacerse más fuertes en el proceso. Siempre hay algunos que salen perdiendo, pero probablemente en la próxima saga eso se subsane. La narración no pierde nunca el ritmo, va hacia distintos focos, pasamos por distintos puntos de vista (todos los cuales están revestidos de importancia), lo que hace a esta saga una muy entretenida, fácil y rápida de leer. Aparte de ser apta para todo público, atraerá a grandes y a chicos. La recomiendo en especial a los amantes de los animales, y a quienes gusten de las aventuras en general. Final volume of this series. Will Brambleclaw catch on that his respected progenitor is bad to the bone? So many hints are dropped to him that it's hard to see how he's so slow.....but he works it out in the end. The Erins do keep reiterating the obvious at times. Can be annoying. A story thread continues that compares faith to lack of faith (and, in one instance, blind faith on the part of Firestar) that lasts the rest of this series. My main complaint at this point is that the books end in a way Final volume of this series. Will Brambleclaw catch on that his respected progenitor is bad to the bone? So many hints are dropped to him that it's hard to see how he's so slow.....but he works it out in the end. A story thread continues that compares faith to lack of faith (and, in one instance, blind faith on the part of Firestar) that lasts the rest of this series. My main complaint at this point is that the books end in a way that doesn't properly seem 'finished', especially the inevitable 6th installment. (I've now read all six of this series so that's my conclusion. i mean, it least it was mostly a brambleclaw pov instead of mostly squirrelflight. still better than moonrise. even if he's dumb. I think this book is really good because i like the on going story behind it. The story line is really great and i am almost done with all of the Warriors series books and i think this one is a good book because it lets a medicine cat learn to help others in a time of need. Okay, this was the best Warriors books so far. 4.5 I wish I could give. It has the edge on Forest of Secrets mostly because I really love the brothers. I still take issue with some of the overly easy characterization the Erins do, which is why I can't give it a five. But the pace was amazing, the intrigue was great and the character arcs were brilliant. I loved this book. It makes me want to jump right into The Power of Three series, even though I've heard that is... not as good. Characters like Okay, this was the best Warriors books so far. 4.5 I wish I could give. It has the edge on Forest of Secrets mostly because I really love the brothers. I still take issue with some of the overly easy characterization the Erins do, which is why I can't give it a five. But the pace was amazing, the intrigue was great and the character arcs were brilliant. I loved this book. It makes me want to jump right into The Power of Three series, even though I've heard that is... not as good. Characters like Squirrelflight, Brambleclaw, Mothwing and Leafpool were all worth reading about their development and choices, as well as my old favorites of Cloudtail, Brightheart and Mistyfoot. As I mentioned before, I am also forgiving of Brambleclaw's indecisive attitude regarding his desire for power in that he feels his father's influence, but it is helped by the fact that Brambleclaw does consider things and reevaluate his positions based on the right catalysts. While Squirrelflight's attitude toward Brambleclaw is bizarre because she, nor Leafpool, have any reason to constantly wonder whether Brambleclaw is like his father, I will allow that it is mostly her frustration at his refusal to consider her perspective. I also feel really, really awful for poor Leafpool (view spoiler)[especially since I know how things turn out for her in The Power of Three (hide spoiler)]. That said, The New Prophecy should have been four books, not six. Dawn was a total waste of time. And much of Starlight could've been handled in Twilight. The overall pacing of the series was atrocious ad the in-between books really dragged. I probably won't be picking up Power of Three for another several months, as I might be kitty'd out, but I hope, for all its other flaws, that it knows how to pace itself. FINALLY I FINISHED THIS DREADFUL SERIES. Let me say something The first series (The Original) was A-M-A-Z-I-N-G and suits any age but this one!! It started great as good or even better than the first series and I REALLLY enjoyed the first two books but what about the rest? THEY ARE CRAP not all of them only the 6th and the 3rd were DREADFUL in my opinion and the 4th and 5th were just fillers. The book is 303 pages First 100 pages Leafpool is FINALLY I FINISHED THIS DREADFUL SERIES. The book is 303 pages First 100 pages Leafpool is healing cats, that was like watching Cat's ER which was so NOT INTERESTING. next 180 pages I don't even know why they were there. last 20 pages were exciting enough that's THE ONLY reason I gave it 2 stars. Anyways I'm not planning to read the third series for sure. These women just want money and they totally forgot about the quality. 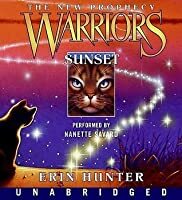 I really feel sooo bad that Erin Hunter ruined the Warriors series that way. I might read Bluestar's Prophecy though, looks promising. Que le daré un 4.5 de 5. Bueno, ¿qué puedo decir de este libro? Acabo de terminarlo hace menos de 5 minutos y literal estoy boquiabierto. Es un final muuuuuuy bueno para esta segunda saga, esas últimas páginas estuvieron llenas de adrenalina, y en general estoy feliz de que en esta última entrega la historia no haya decaído, se mantuvo con el mismo ritmo. Los defectos que le veo a esta última entrega es que acabó abruptamente, las últimas páginas como ya dije son buenísimas, pero acaba muy de repente y uno se queda con cara de: "¿Qué? Le deben de faltar páginas a mi libro", pero no, ASÍ ACABA. Como ya dije, un final muy bueno para una segunda saga que fue súper buena. Estoy satisfecho, aunque igual se haya repetido eso de los capítulos innecesarios. Soon after the cats reached their new home by the lake, ThunderClan's medicine cat Leafpool received an ominous warning from StarClan: Before there is peace, blood will spill blood, and the lake will run red. As the Clan slowly recovers from a devastating badger attack, Leafpool can't help but wonder... do her prophetic dreams mean there are even worse dangers still in store for the warrior cats? At the same time, shadows of the past continue to haunt the forest as some old friends struggle to f Soon after the cats reached their new home by the lake, ThunderClan's medicine cat Leafpool received an ominous warning from StarClan: Before there is peace, blood will spill blood, and the lake will run red. As the Clan slowly recovers from a devastating badger attack, Leafpool can't help but wonder... do her prophetic dreams mean there are even worse dangers still in store for the warrior cats? This review has been hidden because it contains spoilers. To view it, click here. First off, let's just take a minute to admire this gorgeous cover. Absolutely beautiful. Sunset was the most incredible conclusion anyone could ask for, all the loose ends were tied leaving a satisfying ending. And what an ending indeed; dramatic, emotional, powerful. I also never realized how heavily things were hinting at the next series, the three stars, Leafpool's "plumpness," the shadowy forest. Definitely details you only pick up on a second read through. This book alone would make me encoura First off, let's just take a minute to admire this gorgeous cover. Absolutely beautiful. Hawkfrost trapped Firestar, but Brambleclaw killed Hawkfrost, and freed Firestar. There's 4 new kits in the clan, and one of them is called Cinderkit, in memory of Cinderpelt. Brambleclaw is now deputy of ThunderClan. Mothwing of Riverclan has a apperntice, Willowpaw. Meh this one also felt like a bit of a filler, although I am glad of the development that took place in this one, with all of the medicine cat issues and the clean-up after the attack. And a lot of morality issues as well. It felt very middle-grade. Its one of my absoulte favorite books! its awsome how leafpool guides willowpaw in her dreams with feathertail and leafpool says goodbye to crowfeather. brambleclaw kills his own brother to save firestar!